Does it annoy you as much as it annoys me that the the apostrophe is on the wrong side of "50" in that album title? Probably not, so we shall proceed. 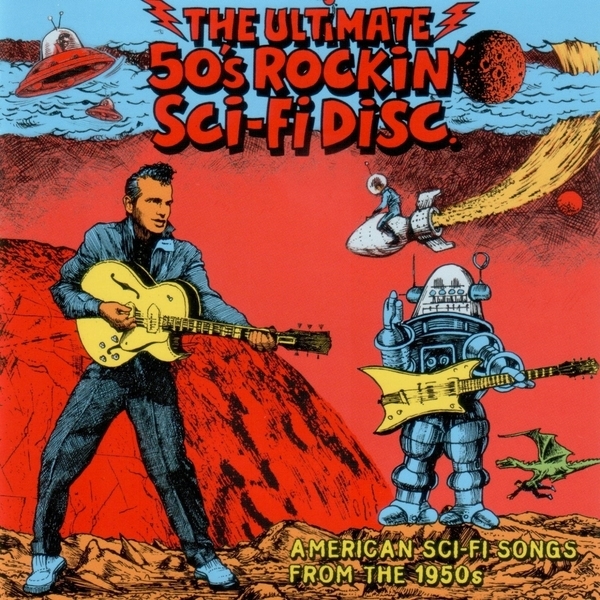 Another supreme selection of themed novelty hits dug up by Viper, this time themed around '50s (see? It's not hard, is it?) sci-fi influenced recordings, largely inspired by the launch of sputnik and the ensuing space race. The compilation harbours its very own X File in Weldon Rogers' curiously monikered 'I'm Building A ??? '; the track drops out every time Rogers is about to reveal precisely what it is he's planning to construct (on the Moon, it should be mentioned), which inevitably leads you to think that it might be something a bit rude because that's generally how these things go. For example, you can't help but feel that on 'Rocket In My Pocket' Jimmy Lloyd isn't strictly singing about the space programme. The subsequent Pinky & Perky vocal tricks of 'The Little Space Girl' further propel the tracklist into the realms of farce, but in this instance that's a very good thing.